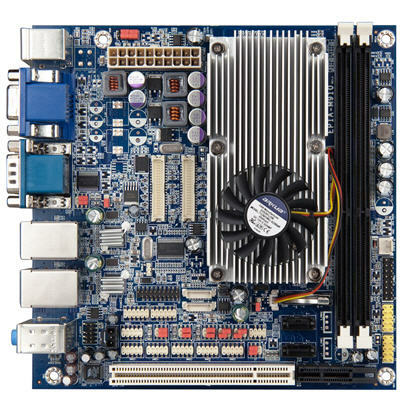 The VIA EPIA-M910 combines a choice of the latest VIA dual core processors with a raft of I/O features including dual Gigabit LAN, eight COM ports, (expandable to 12 with the VIA LPC-01/02 add-on card) and two 18/24-bit LVDS providing the ideal solution for a range of embedded applications including the latest POS, kiosk, ATM, gaming, digital signage, healthcare and digital media applications. The VIA EPIA-M910 is available in both active and passive cooling configurations with the choice of the latest 1.2GHz VIA QuadCore E-Series processor, a 1.6GHz VIA Nano X2 E-Series dual core processor or a fanless 1.0GHz VIA Eden X2 dual core processor. Supporting up to 8GB of DDR3 system memory, the VIA EPIA-M910 is paired with the VIA VX900 media system processor, featuring the latest ChromotionHD 2.0 video engine, which boasts comprehensive hardware acceleration for the latest VC1, H.264, MPEG-2 and WMV9 HD formats at screen resolutions of up to 1080p without incurring a heavy CPU load. Display connectivity support includes onboard HDMI and VGA ports with pin headers for two 24-bit LVDS. Rear panel I/O includes dual Gigabit LAN ports, PS/2 support, one HDMI port, a VGA port, two RS-232 5v/12v selectable COM ports, four USB 2.0 ports and audio jacks. On board pin headers provide one single-channel and one dual-channel 18/24-bit LVDS support (including backlight control), two SATA ports, an additional six COM ports, a further four USB ports, Digital I/O, and a PCIe x4 slot. The VIA EPIA-M910 is available with support for either ATX or DC-in power supplies.